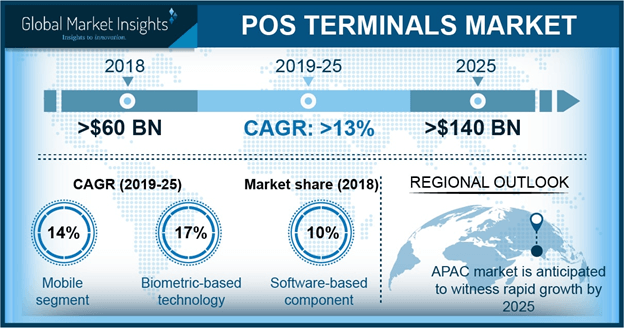 POS Terminals Market size was valued at over USD 50 billion in 2017 with over 45 million units sold and will grow at a CAGR of over 13% from 2018 to 2024. The POS terminals market is expected to witness a high growth over the coming years owing to the increasing technological advancements and the growing adoption of POS solutions in several industrial sectors such as retail, healthcare, hospitality, BFSI, etc. The manufacturers are engaged in developing payment solutions that can be utilized for specific industrial purposes. For instance, in May 2018, Harbortouch announced the launch of Checkout, which is a retail POS system that delivers robust features with a user-friendly interface. The manufacturers are incorporating advanced technologies into systems such as EMV pin pad, barcode scanner, cash drawer, receipt printer, and keyboard. Such systems allow industries to implement a complete solution in their operating centers for simplifying the payment or billing process, accelerating the market growth. The market is driven by innovations leading to the increase in the adoption across different industry verticals such as entertainment, hospitality and restaurants. Manufacturers are investing in R&D to develop innovative solutions for healthcare and retail industry, that will help increase profitability. Several customer-centric companies are depending on fast & secured terminals to reduce the customer waiting time and improve the scalability in business operations. For instance, in May 2018, Paytm announced its plan to invest around USD 30 million for installing POS devices across one lakh retail outlets. Such a rapid increase in investments on payments solutions is providing an impetus to the market demand. The rising demand for wireless or mobile payment solutions in the POS terminals market is expected to grow at a substantial pace due to the increased flexibility & mobility in performing the payment process. Several advantages of these mobile solutions over the fixed payment systems include low cost and the ease to migrate to EMV, accepting mobile wallet payments, tableside payment facility, ease-of-use, reduced installation costs, automated settlements, enhanced customer experience, and increased sales opportunities. These advantages are encouraging industries to modify their traditional payment facilities to mobile terminals, thereby accelerating industry growth. Hardware solutions dominate the market due to the widespread adoption of the systems in several industrial segments. Increasing installation of these payment systems in restaurants, hotels, and resorts will enhance customer experience. These hospitality sectors are installing advanced systems that will allow customers to pay their bills with different available options. The manufacturers are targeting such requirements of the industry by integrating several advanced technologies such as NFC & RFID tag scanners, contactless readers, and QR code scanners. These hardware components are integrated into the payment systems to provide additional features that will enhance sales operations, thereby accelerating the market share. The retail industry accounted for over 35% industry share in 2017 and is experiencing a high demand for payment technology with the rise in customer crowd in retail stores. Retailers are engaged in adopting several strategies to manage and control these waiting lines by speeding up sales and billing operations. The adoption of advanced POS systems allows executives to scan the products, update the details, and generate shopping bills in a very small fraction of time. Integration of innovative features in the terminals such as inventory tracking, maintaining customers record, improved billing processes, offering special discounts and data backup will surge the market. Furthermore, its efficient operational efficiency will drive retail sector demand. The POS terminals market is expected to witness a high adoption of biometric technology over the coming years due to rising concerns for the security & safety of the payment transactions. The biometric solutions integrated into these systems offer superior authentication method that verifies the customer account details with the help of fingerprint, facial recognition, or iris scanning. Moreover, increasing adoption of solutions inbuilt with biometric technology by government bodies to improve the safety of several classified transactions is providing an impetus to the market size. Several manufacturers such as HP, Ingenico, NEC Corporation and Verifone have already developed biometric-enabled devices to secure the user credentials. Windows is the most widely accepted operating system in the industry due to its highly flexible operations and user-friendly interface and will grow at a CAGR of around 14% over the forecast timespan. This operating system provides several advantages over other OS such as ease of installation, high compatibility, faster processing, and supports POS software & other peripherals. Such factors are propelling the adoption of Windows in the market. Moreover, the manufacturers are integrating advanced OS versions into the systems to enhance their performance. For instance, Windows 10 LTSB version is designed to improve the hardware performance of the terminals. It allows the operator to restrict access to software and hardware systems, prohibiting other users to perform operations such as internet browsing. North America market is projected to experience a substantial growth owing to the rapid adoption of the advanced payment technologies with growing urbanization and industrialization. Such factors are driving the adoption of advanced payment systems in several industrial verticals. Moreover, the strong presence of equipment manufacturers and technology providers is the major factor responsible for the high growth of the region. The global players are targeting their offerings in the retail industry, which is the fastest growing application segment in the region. High availability of advanced payment solutions in the region is predicted to drive the industry growth. 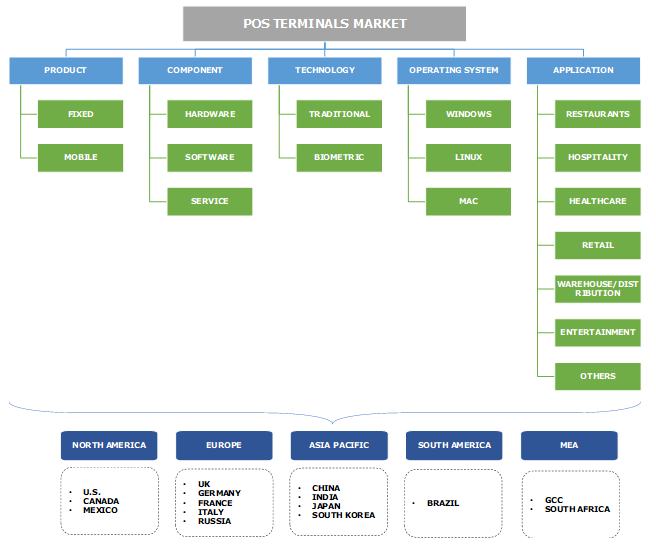 Key players operating in the POS terminals market are Bitel Co., Cegid Group, Cybernet, Bucher Industries AG, Ingenico Group, Epicor Software Corporation, LS Retail, NCR Corporation, Micros Systems, Inc., Panasonic Corporation., VeriFone Systems, Inc., NEC Corporation, POS Direct Ltd., PAX Technology, Toshiba Corporation, and Diebold Nixdorf, among others. The players are developing advanced hardware and software solutions that are developed based on specific application requirements. These companies are engaged in offering mobile technologies by witnessing its high adoption rate. They are focused on integrating several advanced technologies in these products such as biometric verification, EMV, and contactless features. The industry is dominated by major companies such as NEC Corporation, Ingenico Group, VeriFone Systems Inc., NCR Corporation, AURES Technologies SA, BBPOS Ltd., BITEL Co., Castles Technology Co., Ltd., Cisco Systems, Inc. and Micros Systems, Inc, among others. These players are investing large amounts of money on research & development activities to introduce innovative payment technologies in the market. Moreover, strict government regulations & policies in several countries will impact operations & sales of the players. For instance, the Indian government is promoting an initiative to drive cashless transactions in the country. Such initiatives are expected to drive the sales of companies in the industry.